Coup is a bluffing game by Indie Boards and Cards set in the Resistance Universe, a dystopian future society. The game includes 15 character cards, money pieces, and help cards listing the various actions and counteractions. Overall actions that all players, no matter their characters, include taking income, which is one coin, taking foreign aid, which is taking 2 coins, and starting a coup, which is spending 7 coins to kill off one of a player’s characters. The objective of the game is to be the last person with at least one character alive. The character cards each have different actions that can be done. Setup for the game is as follows: all players receive 2 cards, face down. The players can look at their cards to know what their characters actually are, and keep them secret from the rest of the players. One player at a time will do an action. They can get income (one coin), foreign aid (2 coins), coup another player (pay 7 coins), or complete character specific actions, such as assassinate, steal, and tax. Other players can block actions based on their character. Here is where the game gets interesting. This game is about bluffing, so players can do the actions of characters they do not have. For example, if my two character cards are both assassins, but I want 3 coins, I can claim to be the Duke and take the 3 coins. Unless another player questions if I am actually the Duke, I can go unnoticed. But if a player questions my Duke-dom, I have to return the coins because I am not actually the Duke. When performing a Coup, the player paying the 7 coins chooses a player to lose one character.This character is discarded face up, and no replacement is drawn. Assassination’s perform the same way, except they can be blocked by a Contessa, while no one can block a Coup. 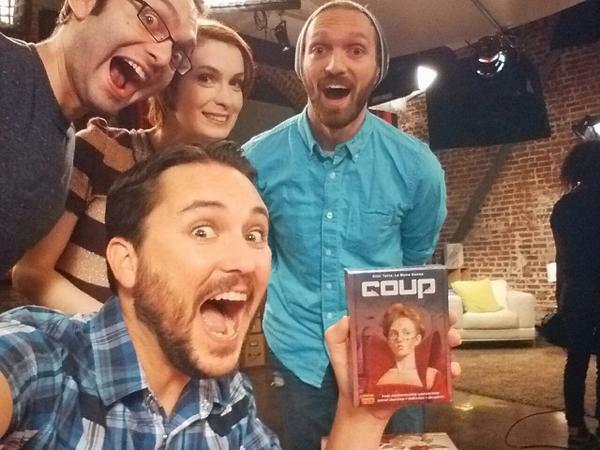 Coup is a very fun game when playing with more than two people. And the less you know the people you are playing with, the more interesting the game gets. It is a quick game to play, so if you don’t want a long RPG or Co-Op, this is a great game to pull out and setup in a short period of time. Coup also has an expansion pack called Coup Reformation, which expands the amount of players that can play, adds a character, and adds additional mechanics such as a treasury. I highly suggest you buy this game, and other games, from local game stores, but Amazon is always an option. The expansion to Coup is also really good, as it adds in some new elements. It changes the ambassador to the inquisitor who can look at someone else’s card. It also has teams – you can’t steal from or assasinate someone on your side, but you can choose to swop someone’s team so can make people victims of coups when other players get close to 10 coins etc. I love coup!! It’s one of those great introductory card games for meeting new people who don’t play games. Though I do prefer the addition of the expansion, adds another element. How much do I love this game! We play it all the time, tho I am the worst liar ever. I always get called out. I recommend it to so many people and will have it at the reception of my wedding for the kids to play. Oh — this could make a fun Christmas gift for some people I know. Thanks for the review.